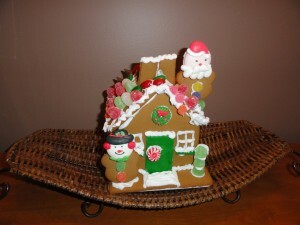 Little H and I put this Gingerbread House together the other day. I had no idea how much joy some pre-fab cookie pieces, icing and candies could bring to a little girl. She enjoyed this activity immensely and I think we created a new family tradition! I so want to make one of these with my daughter. I used to make them every year with my mom and sister. At 2.5 years old though, she would have licked everything before we got started. Maybe in a couple of years. I’m glad you guys had fun. It’s not crazy Melissa! Our Compliments brand products are found at Sobey’s…..which is a Loblaw’s company. Hope that helps!